Home / Best Class Ever! Anything is possible with sunshine and a little pink. A friend of mine gave me this saying on a cute little glass dish. Thank you Pamela 🙂 If anything is possible with a little pink, imagine what is possible with a lot of pink? 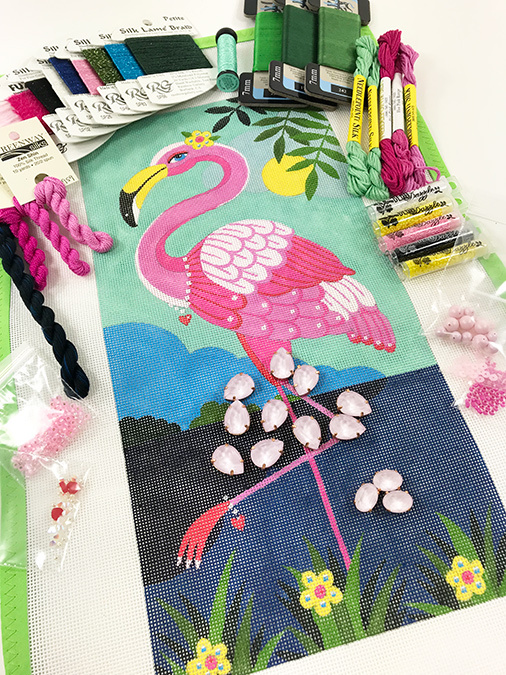 We stitched a pink flamingo with pink threads that are silky, and fuzzy and just a little sparkly. 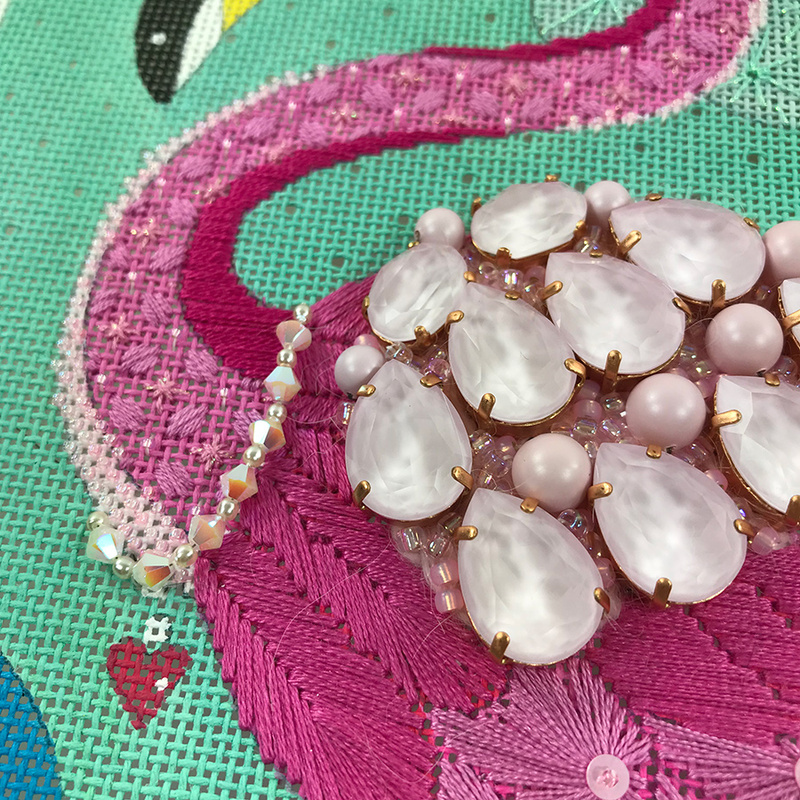 We added shiny pink crystals, beads and pearls. So much fabulous pink. 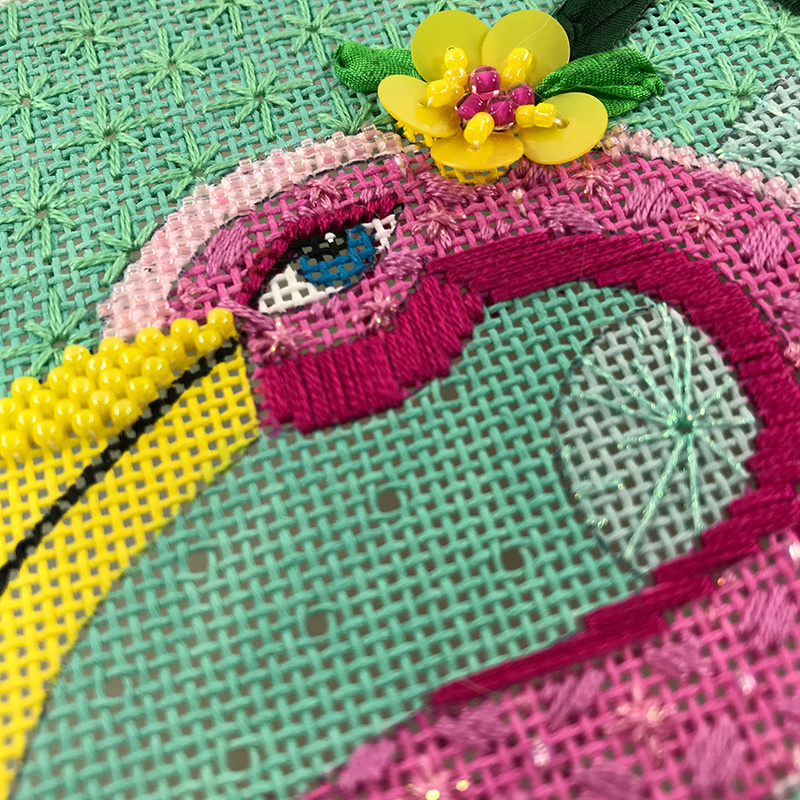 This was a our class last weekend, Flamingo by lulu mypinkturtle. New friends and old. It was a great time. There was plenty of time for stitching and visiting and eating. LOL. Yes, that needs to be part of the fun. There are fun counted stitches in the background. 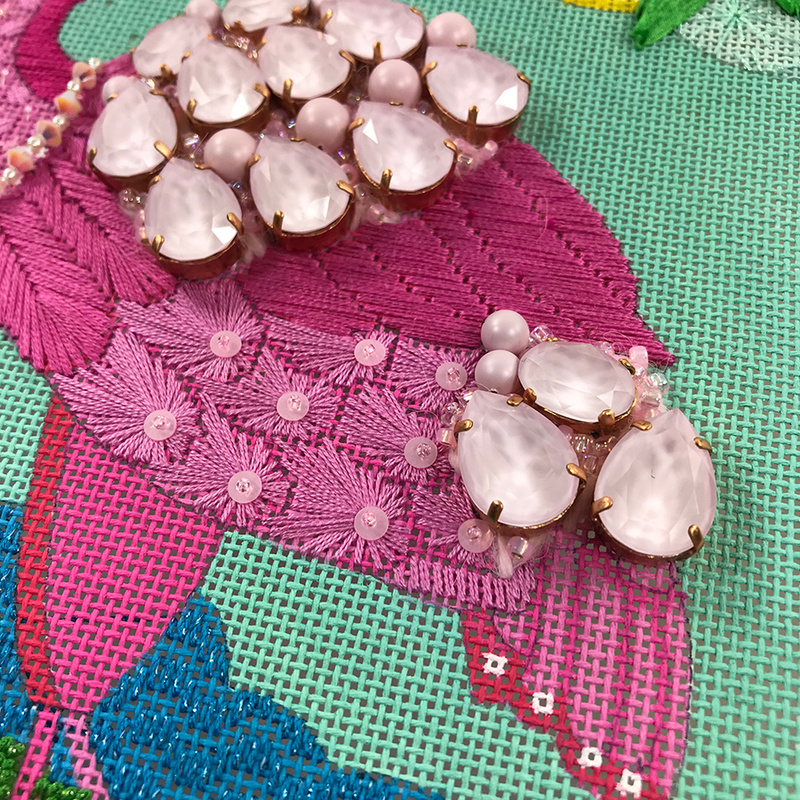 Leaf stitches and eyelets create some of the feathers. We even added a cute little composite stitch for her neck. 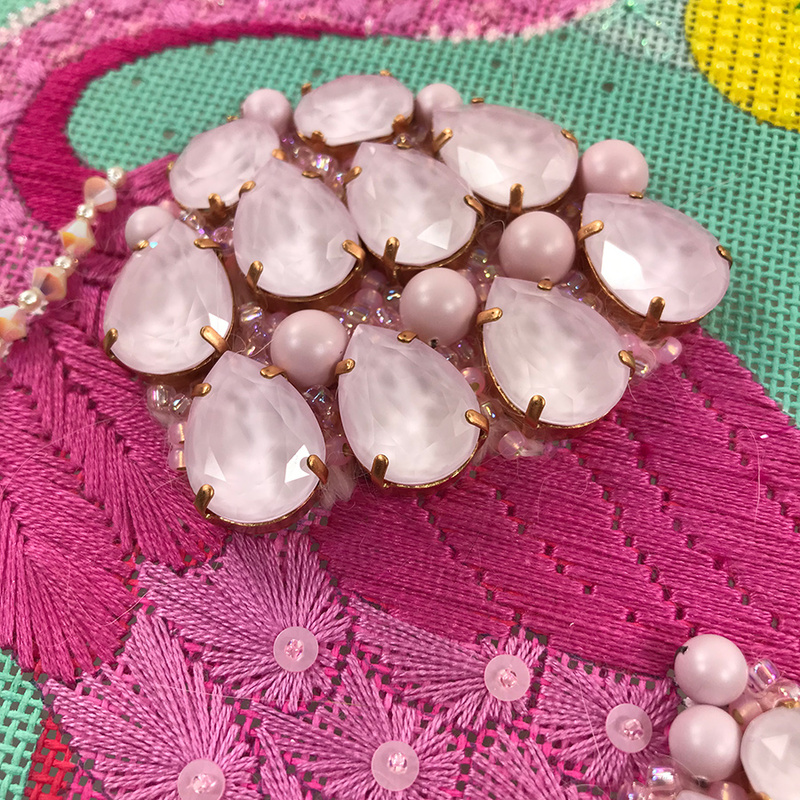 Vintage Swarovski crystals create the light pink feathers on her back and tail. So, cool! Ribbons create the leaves and grasses. Oh look at those sequins! Magical yellow sequins. I love this sassy girl. She’s a fun stitch and small enough to move quickly. 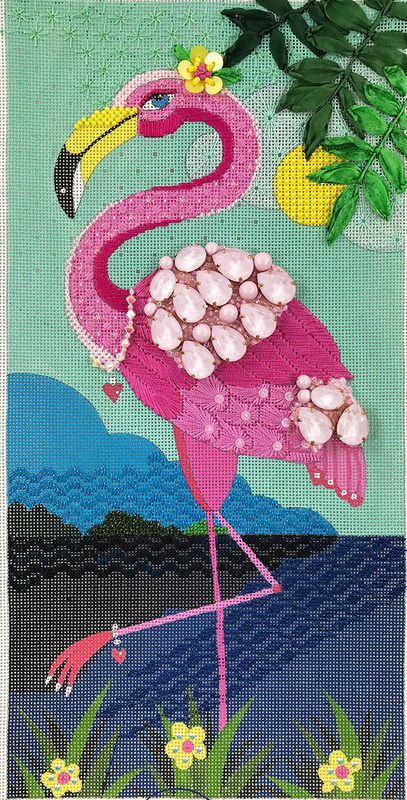 These are the things I love in needlepoint. We covered a lot of different techniques. Lets talk kits for those of you who couldn’t attend. Here’s the reality. I like super cool magical sparkly things. In this case vintage Swarovski. Seriously though, these crystals only hit the market about 2 years ago, but alas they are now discontinued. I have enough for a handful of additional kits. After that I will need to change the components a bit. There will still be crystals but they may change shape or color. So, if you love her as she is, I suggest you don’t delay. Here’s the link. She is wonderful! What fun! As you would say…WOWSA! Can’t wait to get my kit! Omg amazing!!! The body is the best! !